Cheek Augmentation and Cheek Implant Surgery has become increasingly popular among both young and older patients. The number of cheek augmentation procedures using injectable fillers has increased at a rapid rate over the past 10 years. Many fillers such as Sculptra®™, Juvéderm®™, Voluma, and also fat injections have been targeted for use in the mid cheek and malar areas. Augmentation with injectable fillers offers a two-fold benefit. First, the filler elevates the malar cheekbone and adds volume to the mid cheek area for a more contoured look. This result can be equated to Angelina Jolie’s look. The second benefit to augmenting this area with injectable fillers is that there is evidence that filling the malar cheek area helps to elevate the underlying soft tissues of the upper ace. This increased elevation in the upper face in turn pulls up and elevates the lower jowls, flattens out any nasolabial folds and also smooths out the tear trough area eliminating lower eyelid puffiness. The Cheek Implant Procedure reproduces the effects of injectable fillers, but the result is permanent. One does not have to repeat the procedure to maintain the result, as patients do with injectable fillers usually every 4 to 8 months. The implant procedure is performed under Local Sedation and takes approximately 45 minutes. There are several implant materials that can be used in this augmentation procedure, which include Silicone, Medpor and Gore-Tex. The most commonly used implant material is Silicone. Why? Silicone has been used worldwide for years and is proven to be safe. Silicone Implants are used in chins, jaws, breasts, cheeks and noses. Dr. Slupchynskyj’s Cheek Augmentation Surgery uses synthetic or biological materials to augment, or make the malar and submalar structure of the face more prominent and aesthetically pleasing. 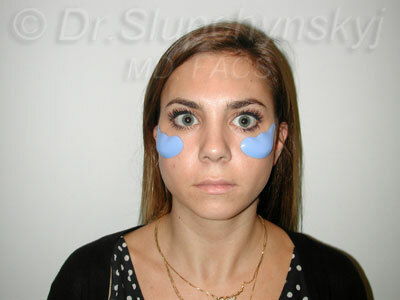 Dr. Slupchynskyj’s preferred technique involves an oral approach where the incision is made inside the mouth, versus in the hairline or intra-ocular (through the lower eyelid). There are no visible scars in this case and oral incisions heal much quicker. What are the Benefits of Cheek Augmentation Surgery? Cheek Augmentation Surgery is effective and safe. Cheek Implants are designed to last a lifetime. Cheek Augmentation Surgery can further enhance an existing cheek structure or augment a weak cheek structure. 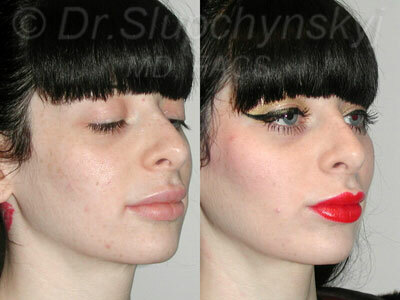 Cheek Augmentation Surgery utilizing Dr. Slupchynskyj’s technique does not have any visible scarring and heals much faster. Cheek Augmentation Surgery helps create a well proportioned, aesthetically pleasing face. Cheek Augmentation Surgery helps to sculpt a poorly defined face, giving beautiful contour and balance. Cheek Augmentation Surgery can be performed in conjunction with other procedures such as Chin Augmentation, Blepharoplasty, Facelift, Lip Enhancement Surgery, SLUPlift™ Mini-lift, and Mid Facelift. A Silicone Implant can be easily removed. Why is this important? If a patient changes his/her mind for any reason about having augmentation, or wants a larger or smaller implant, the Silicone Implant can be easily removed without trauma to the surrounding tissue. This is not the case with Medpor or Gore-Tex Implants, which are both difficult to remove due to tissue ingrowth. This means that the patient’s own tissue grows into the implant. If a Gore-Tex or Medpor Implant needs to be removed, traumatic dissection of the tissue surrounding the implant would need to be performed. With a Silicone Implant, there is no tissue ingrowth. The patient’s tissue forms a capsule around the implant only. A Silicone Implant is more versatile to be modified, reshaped, contoured – in other words, customized – to fit each specific patient’s needs. When is the Implant Size Chosen? Prior to any Cheek Augmentation procedure patients consult with Dr. Slupchynskyj to discuss their objectives and desired result. Many individuals bring photos of other people or celebrities as examples. Dr. Slupchynskyj and the patient examine which implant size and shape would achieve what the patient is looking for; however, it is only during the surgery that the truly correct size and shape can be selected by Dr. Slupchynskyj. Sizer implants are first placed in the cheek pocket at which time, Dr. Slupchynskyj can see if the particular size discussed during the pre-operative phase will achieve the desired result. The patient’s underlying soft tissue anatomy and bony structures must be taken into account and this can only be done during the surgery. What is the Cheek Augmentation Procedure Technique? The procedure is performed intra-orally and starts with creating two pockets where the implants will sit. An incision is made above the upper gum line, dissecting down to the bone and elevating the periosteum over the malar bone, extending out just beneath the orbital rim and dissecting onto the zygomatic arch in order to make an adequate pocket where the implant will sit. Once the pockets are created, Dr. S. uses “sizer implants” to see which implant size and shape fit best considering the patient’s bony and soft tissue anatomy. The “sizer implant” is not the actual implant to be used but is again, one that allows Dr. S to directly visualize which size and shape will best suit the patient prior to inserting the actual implant. It is important to know that implants are always sterile at the time of insertion, as well as all instruments in the operating room. Patients are also given post-operative instructions and antibiotics to help prevent infection. One of the biggest misconceptions about implants is that the larger the implant, the higher the cheekbone. A patient may request the largest implant during a preoperative consultation, when in fact, a small implant will deliver the results they are seeking. The size of the patient’s face, facial structure, and underlying anatomy all come into play when selecting implant size and shape and a surgeon can only understand all factors once the anatomy can be directly visualized. The same size cheek implant will not look the same on everyone, nor achieve the same result! Silicone Implants come in several varieties of shape and size. The Malar Implant is appropriate for elevation of the zygomatic arch area, giving the patient a higher, more defined cheekbone. The combined Submalar Implant is a slightly larger implant that elevates the cheek area, as well as the malar area of the malar bone. Malar Implant on left and Combined Submalar Implant on right. Dr. Slupchynskyj utilizes “sizer implants” to be able to accurately determine the appropriate shape and size for each patient. 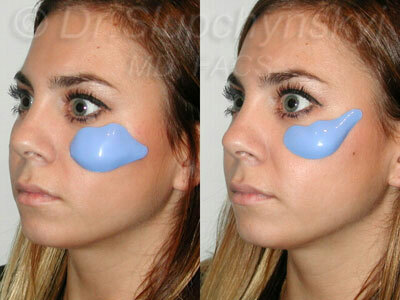 These are not the actual Silicone Implants, which will be placed in the cheek area. Once the size of the implant is selected, the actual implant(s) are removed from a sterile box provided by the implant company. The implant goes from this sterile container right into the implant pocket, which is then secured using a 6mm self-driving titanium screw. This stabilizes the implant in the exact location it needs to be. There is no movement or migration of the implant. This screw must be meticulously placed so that it does not penetrate the interior of the sinus cavity of the maxillary sinus. The goal is to keep the implant sterile in its pocket and prevent communication between the sterile pocket and a non-sterile environment (sinus cavity). Once the implants are placed and secured, the incisions are closed with an absorbable suture. As always, good health and realistic expectations are necessary for any successful result in Cosmetic Surgery. 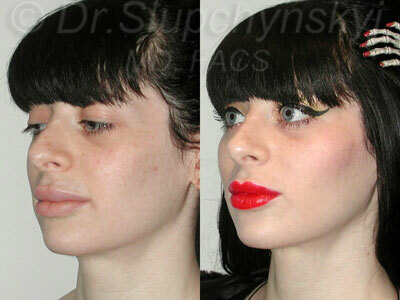 Cheek Augmentation Surgery is a good choice if you have a drawn appearance with sagging or weak cheek structure. Cheek Augmentation Surgery is also a good choice to enhance what you naturally have. During your consultation, Dr. Slupchynskyj will closely examine your facial features and dimensions and thoroughly describe what you can expect from Cheek Augmentation. After examining your face, Dr. Slupchynskyj will discuss with you his suggested placement and size of the cheek implants. Last, risks, which may affect surgical outcome, will be discussed. What can I Expect during and Immediately Following My Cheek Augmentation Surgery? Cheek Augmentation Surgery is performed under Local Anesthesia and light sedation. The procedure is performed on an outpatient basis and lasts approximately one hour. Your results are immediate and you may experience some bruising and swelling. This is normal and will start to diminish within five to seven days and resolve completely within a few weeks. The sutures, if any, will be removed between three to 10 days depending on your individual case. Are there any Risks to Cheek Augmentation Surgery? What is My Recovery Time? Dr. Slupchynskyj will advise you to avoid any strenuous activity until he is confident you are healed. Dr. Slupchynskyj will also advise when you can return to normal activity, which for most patients, is within one to two weeks post-surgery. Many patients return to work within five to seven days. If your incision was made orally, you will be advised to chew soft or liquid foods and maintain excellent oral hygiene during the healing process, as lack of oral hygiene increases risk of infection. Recovery for most patients is 5 to 7 days at which time the patient may experience swelling. There is minimal to no bruising. By day 7, 85 to 95% of the swelling should resolve. In some cases, it may persist up to two weeks. The most common complications include bleeding or infection, which if they do take place, typically occur with the first hours or days following surgery. Another complication that could arise if the implant is not placed appropriately is irregular contouring, which usually can be seen in the lateral aspect of the implant. The only way the implant can be dislodged is through traumatic injury or impact to the area. Cheek Augmentation with implants is ideal for patients wanting more volume in the malar and upper cheek area. The result is permanent; however, should the patient want a Silicone Implant removed, it can be without complication. How Long do the Results of Cheek Augmentation Surgery Last? 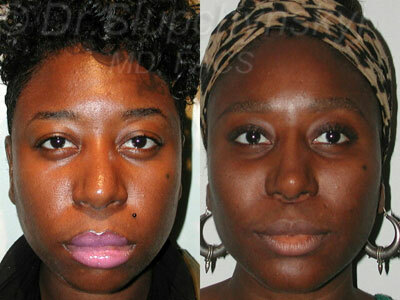 38 year old African-American female unhappy with lack of definition in her cheeks. 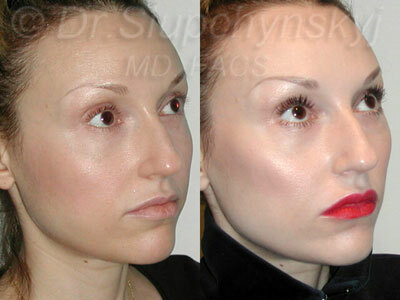 Dr. Slupchynskyj performed Cheek Augmentation Surgery, placing large Submalar Implants in the cheek areas achieving elevation in the cheekbones, as well as contour and definition. 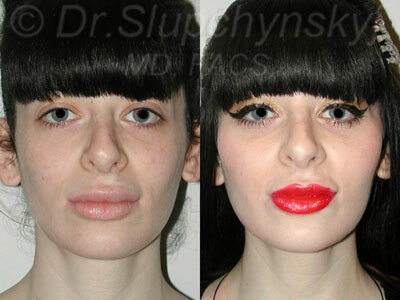 This patient had also sought Dr. Slupchynskyj for a Revision Rhinoplasty. She had a previous Rhinoplasty procedure with another surgeon where a silicone implant was placed in her nasal bridge in an attempt to elevate her bridge. 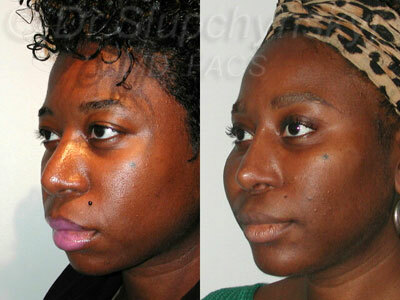 This implant created more bulk and width in her nasal area, as well as a downturned nasal tip and Pollybeak Deformity. Dr. Slupchynskyj used an open approach to remove the old implant and placed a custom carved silastic implant on her bridge while also defatting her tip. Multiple cartilage grafts were used to reconstruct the nasal tip and restore adequate projection. 32 year old requesting higher cheek bones but did not want surgery. 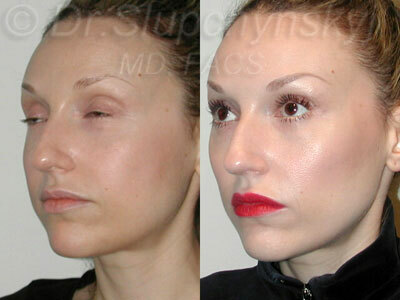 Dr. Slupchynskyj performed a Non-Surgical Cheek Augmentation using Radiesse®. Dr. Slupchynskyj likes to use Radiesse® because when injected in the right tissue plane, it has more filling power and last longer that other injectable fillers such as Voluma or Juvéderm®™. 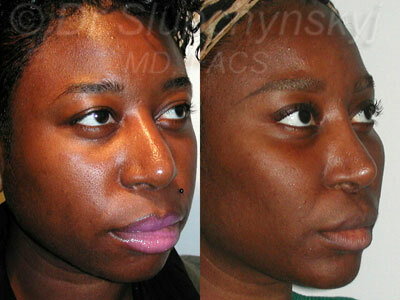 The patient also wanted to see what permanent cheek augmentation would look like. This closely approximates Cheek Augmentation with a Silicone Cheek Implant. 27 year old female who had been getting Juvéderm®™ in the cheek area. 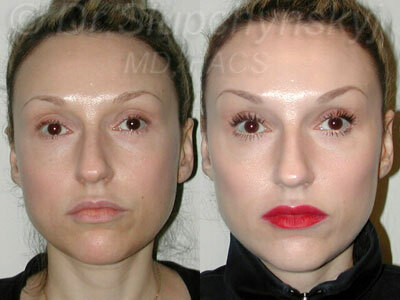 Although she liked the malar elevation and cheek fullness, her results were temporary, as they are with most injectable fillers. In addition, she desired a specific result that the fillers could not achieve alone. Dr. Slupchynskyj performed a sub-labial approach Cheek Augmentation procedure and inserted custom sized and shaped Cheek Implants. Patient is very pleased because of the shape, size and elevation the Cheek Implants gave her the results she truly wanted. Contact our office today to find out why people choose Dr. Slupchynskyj and Cheek Augmentation!